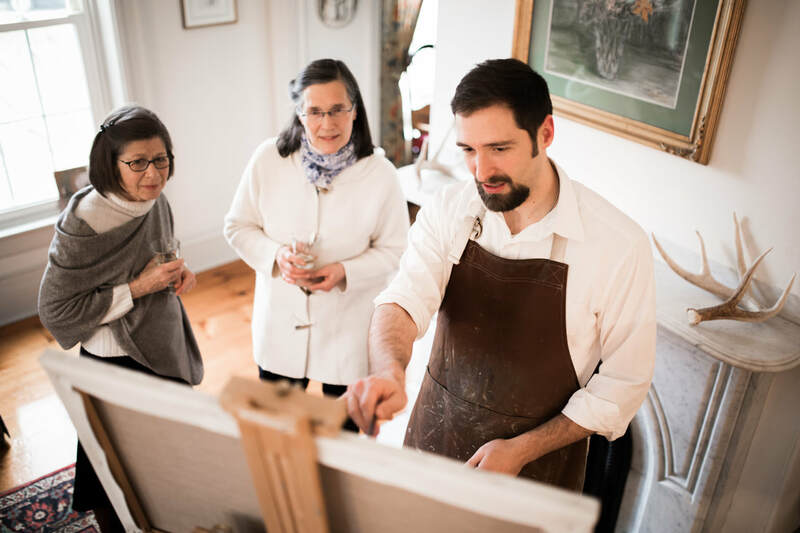 For a unique and memorable addition to your event, invite John Folley to bring his easel and paint for your guests' enrichment and entertainment. 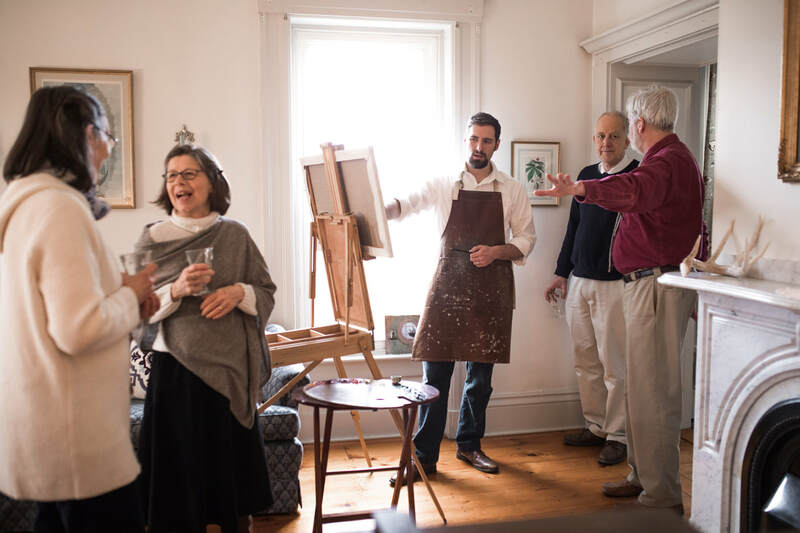 John's presence is guaranteed to break the ice as you and your guests engage with the painting process and learn about John's Boston School approach! Just as a string quartet can provide elegant background music to a cocktail hour, let a real artist enhance the atmosphere in your venue. John is very comfortable painting in company, either indoors or en plein air. He is also happy to engage questions and discussion from attendees as he works. Depending on the subject matter and the engagement of the crowd, he can complete a painting within a 3-5 hour span, so that your guests can actually see the progression of a fine oil painting and its completion by the time they depart! John’s presence gave our guests something they could enjoy in real-time. Throughout the evening, it was great to see people strolling by John and enjoying the progress that he was making throughout the event. Guests loved watching the progression of the art. John brought a wonderful, unique element to the event that most people don’t get to enjoy. It was a pleasure to see his interpretation of the garden setting. ​John was professional, presentable and very polite! He was engaging to our guests and welcomed their questions and comments throughout the event. Several guests commented that it was nice to see such a unique service at the party! I would highly recommend John for anyone looking to bring in a captivating, unique entertainer. We received the picture and we loved it. Such a cool way to capture our special day, and guests enjoyed interacting with John through the evening. All rave reviews over here! John was a delightful addition to the event and added a whole new layer of thoughtfulness toward the opening of NeuroInternational's program in NH. John was terrific to engage with our guests while also executing his craft. He was accommodating, came fully prepared, and our expectations were more than met. We will recommend this line of John's work to our friends. Book a live portrait sitting! John can bring a model with him and paint a portrait over the course of your 3-5 hour event. Your guests will enjoy the experience of a face coming to life on a canvas and become more familiar with the portrait process. The model will require several 5-10-minute breaks during the process; otherwise John can keep progressing on his painting for the duration of the event. For outdoor events, John can paint a landscape, cityscape, or architectural scene to capture the setting. The painting can then be available for you or your guest to purchase upon completion. Example: John could be present at your wedding reception to capture the mountain view, and then you could keep the painting as a memento from your special day! Example: John could paint the garden and atmosphere as a reminder of your garden party! Book a themed painting session! John can work with you to envision a still life or scene from imagination that would embody your event. The painting would then be available for you or your guest to purchase upon completion. Example: For a corporate wine-tasting event, John could set up a still life with wine bottles, grapes, a basket, bread, and cheese. Example: For your Fairy Tale-themed gala, John could paint a fantastical scene including a dragon and a knight, from imagination. Example: For your wedding reception, John could paint a still life featuring your cake or one that features your floral arrangement. Raffle option: For your fundraiser, have John's painting from that event to be raffled off to the attending crowd. We can arrange to have proceeds from the raffle donated to your institution/charity. Be in touch to find out if this could work for your next event! ​All of the guests at our fundraiser banquet absolutely loved engaging with John, seeing his process, and enjoying his beautiful artwork on display. He added a very unique and classy element to our evening! Raffling the painting off for our cause was an exciting and effective addition to our fundraising efforts. I hope that we will have the opportunity to have him back next year. It was fantastic!! "Absolutely delightful! Mr. Folley is a perfect gentleman, and seeing the transformation of a plain canvas to a work of art is a rare and striking experience." Having John paint for our guests at our benefit gala was a huge hit! Not only did our guests enjoy such a unique and fascinating experience of seeing him paint right there, but the raffling of the painting added a boost to our fundraising efforts! Somehow he completed a beautiful painting from start to finish in just a few hours while engaging everyone in a fun and friendly manner. After how much it was talked about and seeing the results, we are definitely hoping to partner with him again next year! Ours was a formal cultural occasion and John's presence certainly added to the nobility and charm of the evening. Guests fondly spoke of him as 'the artist' and it only seemed natural that his work, the clinking of glasses amongst conversation, and the notes of the piano mingled in the hall. He widened the experience of our gala and several guests happily remarked that his presence really allowed for what one might call a "European experience." John was lovely to work with, very accommodating and courteous. We decided to include John as entertainment during our institutional fundraiser dinner, along with our live music and speakers. John's manner was welcoming - he kept talking to guests throughout the whole evening and was very engaging, approachable, and friendly. The crowd was intrigued to see his progress as the evening went on and having him painting there definitely enriched the event. I wouldn't change anything about having him come; we were very pleased! We decided to change up our Acoustic Brunch recently and invited local artist John Folley to do a live painting while our members enjoyed their meal. It was a big hit! We found our members intrigued as John maneuvered his way through the start of his work to the very end. He was warm and inviting and answered all questions in a professional, yet casual and down-to-earth way. Families wound up staying longer than anticipated and just watched him work while they sipped their mimosas. We would definitely bring John back for another event and highly recommend his talents if you are looking for something different and artistic! Let us arrange for your needs. ​​John can be a feature and focus of your event, with a heavier emphasis on demonstration, education, and interpersonal engagement; or he can be a quiet side-show, providing a subtle, fascinating element to your day or evening which your guests are sure to talk about. We are happy to discuss different scenarios with you and make a plan that will fit the needs of your event and make the impact you are looking for! 'Fireside at the Club Restaurant' completed within three hours. 16 x 20"
'Let Life Shine' in progress at a fundraiser event; completed in approximately two hours. 14 x 11"
"Pheasant Weather" completed in three hours. 20 x 16"
'The Old Coach House' painted live within three hours and completed in studio. 16 x 20"
The purchase of the completed painting is additional. Various sizes and custom dimensions available. A standard 16x20" painting is $600. John is based in Massachusetts with his studio in Lancaster, MA. He is available for events in Central Massachusetts and Worcester county, as well as the greater Boston area, including southern New Hampshire. He is happy to work throughout New England and in any other area of the country (and worldwide)! Travel costs for events at a distance apply and may include parking, car mileage, airfare, and/or lodging. We are happy to talk through the specific price based on your needs. Please don't hesitate to be in touch to discuss the possibility of Live Painting at your event, large or small, intimate or grand.